For those who are heavily interested in politics, social media offers an especially compelling environment for engaging with news, information and discussion about political issues. But although social media can help facilitate connections to the causes people care about, it can also expose these same users to negative or aggressive speech and require them to more attentively curate their social feeds. Compared to those with lower levels of political engagement, highly-engaged social media users take a fairly active role when it comes to entering into political discussions or otherwise engaging with political content. Roughly one-in-five (19%) of these highly engaged social media users “often” comment, post or discuss political or government issues with others on social media, triple the share among social media users who are less politically engaged (6%). These highly engaged users also take a more active role when it comes to curating their online political networks. For instance, they are more likely to follow political candidates or figures: 53% do so, compared with 21% of users with low levels of political engagement. And when one of their friends posts political content they disagree with, some 30% of highly engaged social media users say they typically respond with a comment or post of their own. That is more than double the share of less-engaged social media users who typically respond in this way (13%). In addition, 42% of these politically active users have changed their settings to see fewer posts from someone they follow because of politics (30% of less-engaged users have done so), and 34% have blocked or unfriended someone as a result of politics (compared with 26% of less-engaged users). However, the root causes that each group give for doing so are largely the same: by a substantial margin, both groups say that the top reason they take these steps is because someone posted political content that they found offensive. 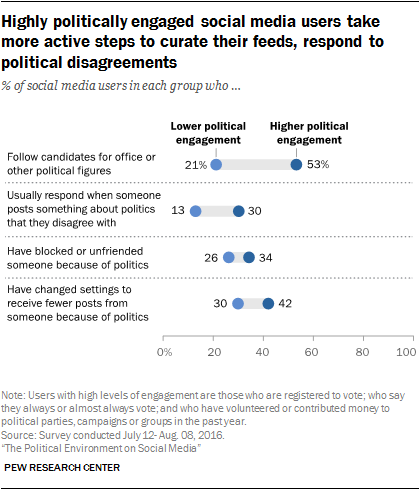 When asked about the political interactions they see on social media, many politically engaged users are dismayed at the negativity and tone of political discourse. For instance, a slight majority of these users (53%) agree that the statement “people say things when discussing politics on social media that they would never say in person” describes social media very well; 38% of less-engaged users feel equally strongly. These highly engaged social media users are also more likely to feel that the discussions they see on social media pertaining to politics are less enjoyable in a variety of ways than the political discussions they see occurring elsewhere. This is especially notable in the context of political correctness: Fully 57% of highly engaged social media users feel that social media conversations are less politically correct than those they see elsewhere: Just 39% of less-engaged users feel the same way. And a substantial majority of highly engaged users see social media as angrier, less civil and less respectful than other venues for discussing politics. Yet even as they express heightened concern at the tone and tenor of social media conversations, highly politically engaged users also express greater appreciation for the ability of social media to foster inclusivity and to connect people to causes that are important to them. 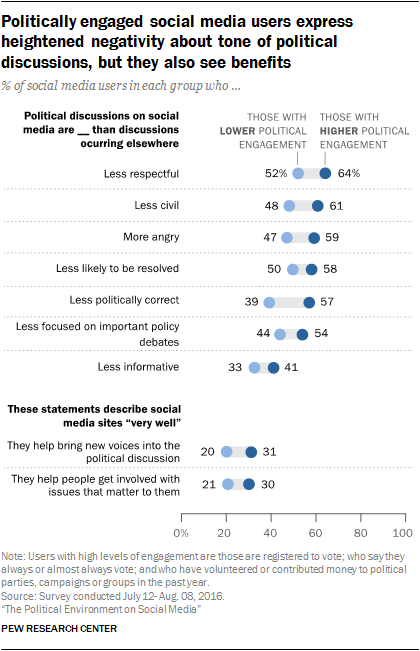 Nearly one-third of highly engaged social media users (31%) feel that social media bring new voices into the political discussion “very well” (vs. 20% of less engaged users). Similarly, 30% of highly engaged users say social media help people get involved with issues that matter to them “very well,” compared with 21% of less-engaged users. And these politically engaged users are around twice as likely as less-engaged users to say that they ultimately like seeing lots of political content on social media (35% do so, compared with 18% of less-engaged users).